Posted July 9, 2013 by Josette Farrell in Sport. Congratulations to the juvenile Galway City Harriers athletes from Claregalway who won individual All-Ireland medals at the outdoor national athletics finals in Tullamore this past weekend. 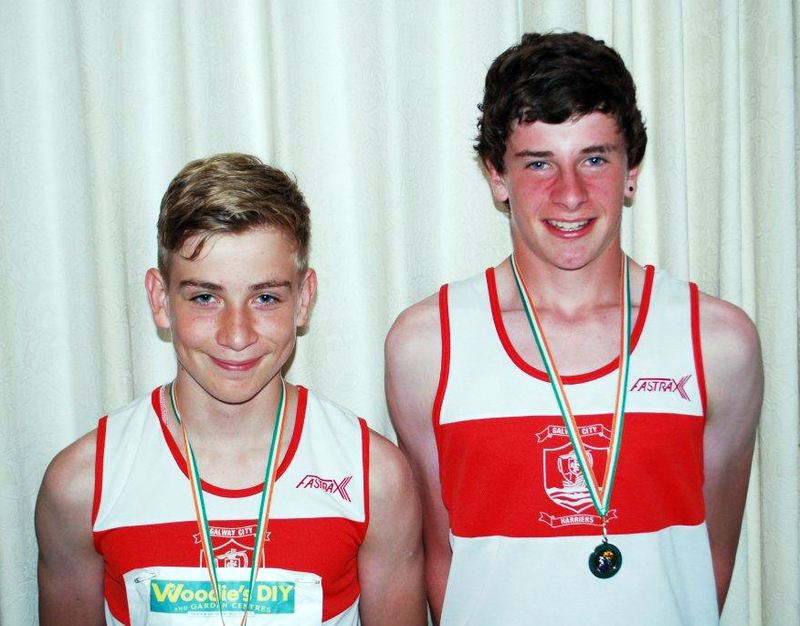 Left: Sean Kilmartin, Kiniska—Bronze medallist in the All-Ireland 250m hurdles final. Right: Cilin Greene, Kiniska—Silver medallist in the All-Ireland 100m final. 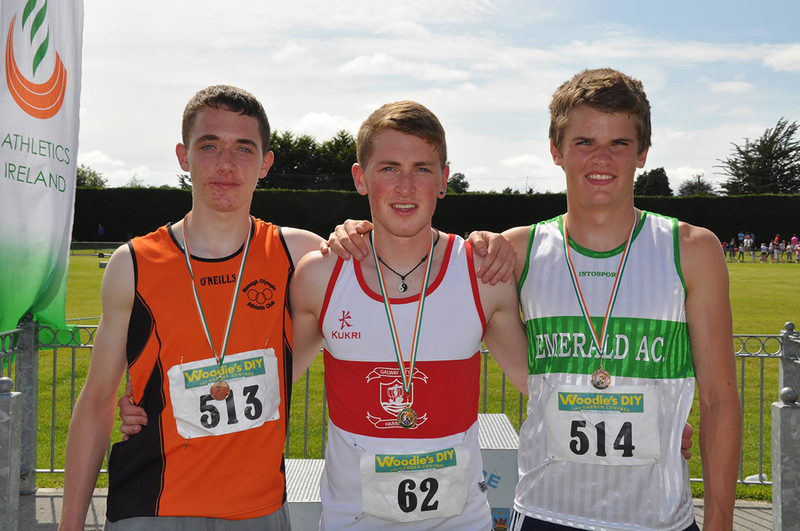 Another Claregalway Juvenile, Evan McGuire (pictured centre) took two individual Golds at the All-Ireland finals last weekend—one in the 400m hurdles, in which he got an U19 Championship Best and the other in the 400m race. 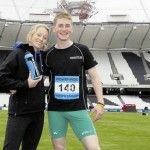 Congratulations Evan and what an achievement! A number of GCH athletes from Claregalway area qualified for the All-Ireland athletics finals held in Tullamore this past weekend. Congratulations to all of them including Andrea Trill (U12 Shot putt) , Clíodhna Ní Chochlainn (U14 javelin), Laura Nally (U14 800m), Kristian Flaherty (U12 600m), Cilin Greene (U16 100m), Sean Kilmartin (U15 250m hurdles), Evan Mc Guire (U19 400M/hurdles). 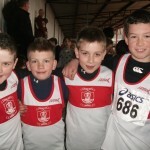 It was a great achievement to qualify through Connacht and reach the All Ireland finals. 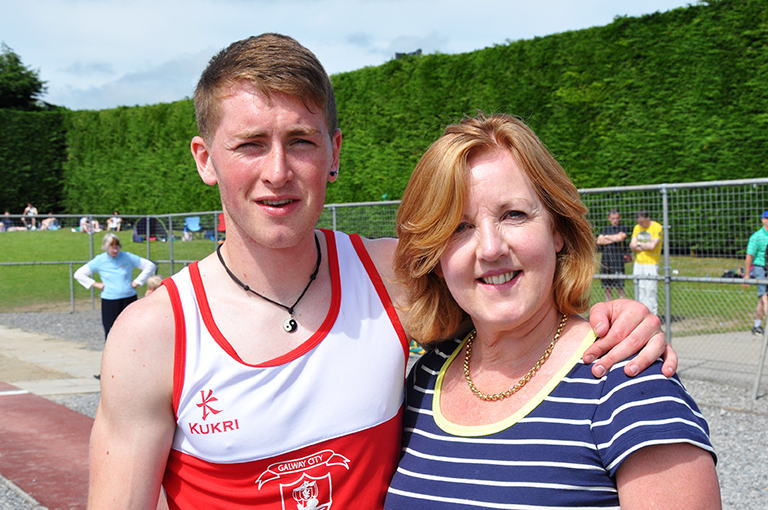 Particular thanks also to GCH coaches Pauline Harrington (pictured above with Evan McGuire) and Frank McGuire, again both from Claregalway. It’s great to see dedicated coaches from Claregalway helping to guide the GCH athletes through the juvenile grades. Your help is really appreciated by all in the community.